Boo! Halloween week is finally here!! Raise your hand if you are as excited as me! 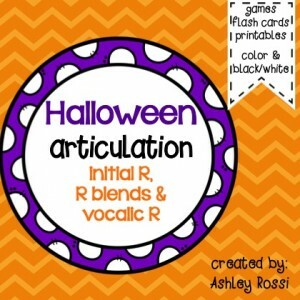 I’m Ashley from Sweet Southern Speech and Speech Spotlight is teaming up with the Frenzied SLPs to bring you some fun ideas to incorporate Halloween into your therapy sessions. Books! 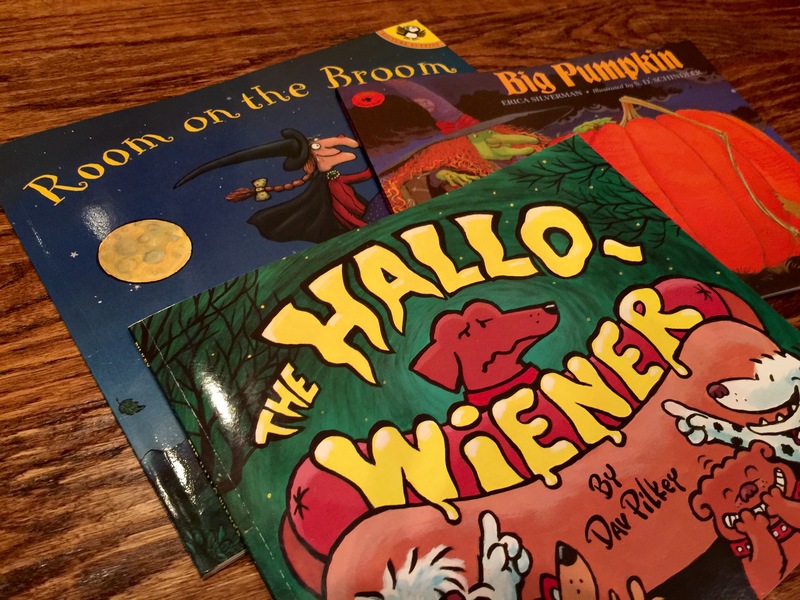 The Hallo-Wiener by Dav Pilkey. Oh my! This is the cutest. Great for teaching about how we treat others, friendship, and self-confidence. Vocabulary to target: obedience, farewell, daydream, dashed, fainted, block, howled, hounded, graveyard, waddled, ornery, raft. 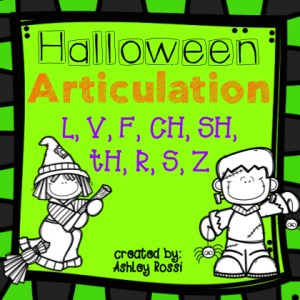 Articulation: R- (Oscar, wiener, mother, farewell, scary, other, trick, treats, graveyard, screamed, monster) S/Z- (Oscar, dogs, school, sausage, treats, costume, scary, silly, spooky, monster, us, hissed, cats, embarrassed). Room on the Broom by Julia Donaldson. My ALL-TIME favorite book. The rhyme of this adorable story about a nice little witch and the friends that help her is contagious and fun to let the students join in as you read. The vocabulary in this book is crazy-good because anything by Julia Donaldson is good: wailed, bounded, eagerly, politely, keen, clambered, clutched, fluttered, moors, reeds, cloak, bog, squelched, cauldron. If you are working on adjectives, the descriptions here are divine! They describe the witch’s hair as “ginger.” Ask your students if they can think of other hues to name colors (scarlet for red, chocolate for brown). What does it mean by, “thundering paws?” You can easily target sequencing here too with the order of the animals they came across or the items that the wind blew off her hat, or the items each animal contributed to her cauldron potion. Articulation: R (room, broom, hair, broomstick, braid, bird, dragon, cauldron, frog) L (black, wildly, long, flew, blew, clutched, cloak, fly, spell). Figurative language: find rhyming words, and alliteration. Another way I incorporate Halloween into my therapy sessions is through crafts. 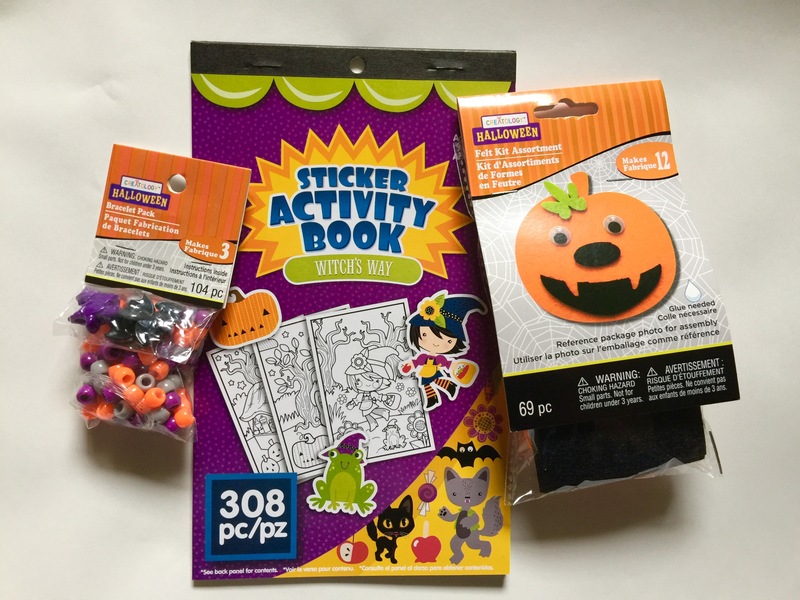 I always head to Michael’s and grab some of their inexpensive crafts – you can target anything! 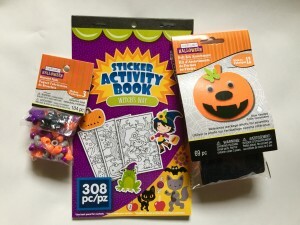 I grabbed these cute little felt pumpkin crafts (makes 12), necklaces (makes 3), and sticker activity books that has picture scenes, coloring pages, and stickers. I use crafts when I’m working on auditory comprehension: I will say the direction and they repeat it back to me, or for sequencing: (first cut this, then glue that, etc. 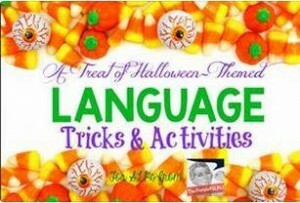 ), or for basic reinforcement: answer a few questions, say a few articulation words and take a turn. I love doing sticker stories!! The kids get to make up crazy stories while working on writing: grammar, dialogue, content, sentence length, punctuation, etc. 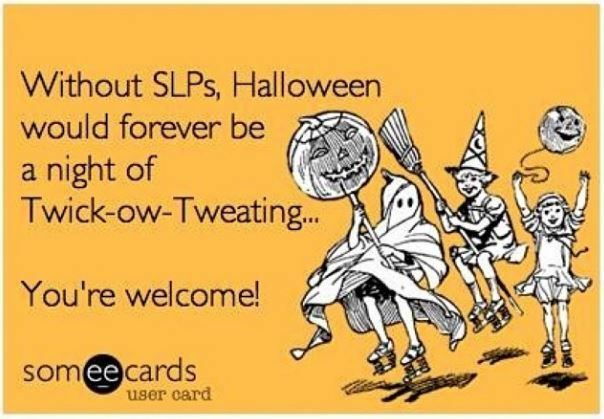 The other fantastic ladies of Speech Spotlight also have some spooktacular Halloween products in their TpT stores as well. Click the links below and check them out! Happy Halloween! May you all get treats, not tricks!! 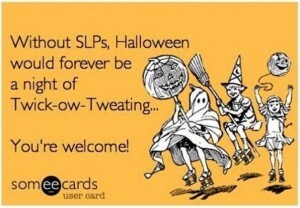 Thank you so much for these great therapy ideas for Halloween! I have fond memories of reading my own little children Room on the Broom! Great ideas, Ashley! Thank you so much and for the funny e-card, too! Great fun Ashley! I’ve been wanting to get “Room on the Broom”, thanks for telling us a little bit about it. 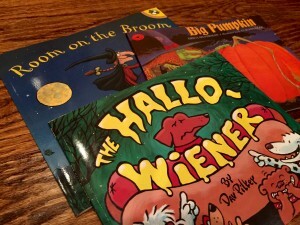 The Halloweiner is one of my favorites! Thanks for linking up and sharing great ideas and resources! Books are my fave too! I totally forgot about Halloweiner! I need to dig that out today! Craft time is always a chatty time, perfect for SLPs! Great book selection! Thanks for all of the ideas! I just bought “Big Pumpkin” today! Too cute!